Often the only solution to treat someone ailing and dying is to donate a whole new organ from a donor. The organs that may be donated are hearts, skin, eyes, livers, corneas, kidneys, lungs and various other organs. These can be harvested from those willing donors who have died. Sometimes the organs will be taken from the dead person with the consent of the family of the dead member. It is these valuable organs that are put into the bodies of the suffering people. Every time in the world there are about one hundred thousand people are waiting for the donated organs. The chances are that most of the people will die before they get treated with one while there are some who can be able to get a second option to live to the fullest. But there are many people who are quite hesitant to donate their internal organs to others for many different reasons. The people feel reluctant due to the lack of proper education. It has been said that many people are not completely aware of the importance of donating the organs. It is only by delving deep into the pros and cons of the idea of donating the organs the person will be able to make a very informed solution and decision. Below are stated some of the pros and cons of donating the organs. Some of the organ donation advantages are listed below. Most patients who donate the organs are managed only by the treatments that are expensive and painful. The traditional costs of organ donation will be a lump amount which will lead a family through agony and misery. The donors will not be aware of the importance of the organ donation. They must bear in mind that their internal organs will be able to save the life of a person by enabling them to lead the life for a second chance normally. The act of donating the organs not only saves the life but will also reduce the financial struggle of the family of the patient. It will be grievous if any of the family members will die in a very young age. The family will be normally overwhelmed. The organ donation will easily heal the plight of the sudden death of the amiable ones of the family. It is truly overwhelming to just think how an internal organ will save the life of another person and their family. The sense of providing the consolation will also be felt if a person donates the organs to the suffering younger people. It will prevent the people from dying desperately at young ages. If someone is not in the right mood to benefit the strangers by donating the organs, then they can donate the internal organs to the scientific labs. This is because the students of the Medical Colleges will need the cadavers to analyze their methods in a real time approach. This will also reduce the risk of conducting the experiment in a less risky atmosphere and will help them to grow as perfect doctors. 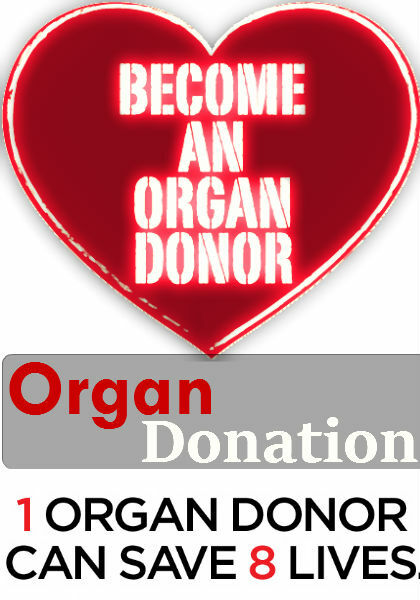 Therefore the idea of the organ donation has become a regular gift to the society and the scientific studies at large. A general belief by the people is that the people who are against the idea of donating the organs is that the body can be harvested after they die. The reality of being slithered open after death to remove the vital organs will only make some people writhe in horror. This is quite funny as the people will not be present at the time of removing their organs after their death. These people do not understand that they will really help those even when they are still alive. The human body has different organs that a person will donate to survive. This will make the people in need to greatly improve their quality of life. Many of the living donors of organ will consent to it only when the family members come forward to help their amiable ones. If a person who wants to assist a total stranger will still have the choice of volunteering. It is a applauded humanitarian act to register for the organ donation to provide help to an unknown person who has left no place to turn their attention to. People of any age and gender can become an organ donor. It is only necessary to sign a card. Or else the people can directly register themselves in the website that is run by the government. The registry of the donor can be also signed and also the person can sign at the back of their driver’s license. The young children can become the donors after the consent of their parents. The sick people too can transplant some organs to give to the people in need. The human body can be also donated in its entirety. If a person tends to donate their vital organs, they will have very less say to know where they will finally stand up. To the people who are very religious, the notion that they will have to donate their internal organs to be used to offer assistance to somebody of another faith will be very difficult to bear. Similarly the recipients will also have some of the different perceived views on politics rather than what the donor actually does. In order to donate the vital organs with no problems, the person has to be one who understands that all life of the human is equally good. The person who does not have a great sense of gratitude and really and truly appreciates the gift of life by the nature will never get to feel about the comfort in the idea of donating the organs to anyone who is in need. The first and the top motivation to donate the organs are to paying it in the first hand. Though this is a good concept to adhere to and there is also a large gang of people who do not trust in the concept. There may be chances for the complication to occur prior and after the donation to harvest the organs. The complications are varied and they may be like increased bleeding, clotting of blood and infection in the part of the body where the surgery was conducted. Certain complications are regulated by the doctors. There are also some grave situations where the complications will become very fatal to the donors. In several cases, the donors will not be able to select the recipients who will get their organs. This is the most serious disadvantage of the organ donation as the religious notions of the recipient may vary from the donor. There may be some donors who wish to donate their organs to a particular person and similarly there may be some recipients who wish to receive the organs from some people. But it will happen though the chances are rare only in the cases of emergency. Despite being illegal in several nations, the illicit trade of the human organs has been widespread globally with rich amounts of money on the line. Most of these rackets have been ousted but some of them are still working. The unstabilized ratio of the required and the available organs is said to be the reason for the responsible for the illegal trade to happen. It has indeed said to have become a pity that due to the rich money that is involved in the business, many people like the prisoners and small children are sometimes kidnapped to trading the organs. But some of them are unwillingly forced to donate their organs. Many problems will occur, if a person reasons to donate his organs. The financial problem can be one among them. In case if the donor is dead, the protocol charges of donating the organs must never be paid by the family. In case if the person is still alive, the procedural and other costs must be borne by him. They will also have loss of pay when he is absent in a day’s work. Sometimes it happens that after the surgery, there is a possibility of losing the work by the person. It is inevitable. Read: Treatment procedures in a simple way! Some people are very happy to donate the organs to the deserving recipients. But, the organ transplants are not always relieved from scams. The complications will occur when a donor wishes to provide the person the gift of life that will end up in the exact opposite. The recipients will never be fully aware of the dangers that are linked with the transplants. Placing the foreign organs into the body of a person will often result in infections and in some cases death. The organs that are taken for the donation will never be checked enough in certain cases. Even the organs that will be considered fit for transplantation will not be so. It will be impossible to say beforehand how the body will react to the donated organs. The immune system of the recipients will consider them to be a potential threat. The infections can be transmitted by the organ transplants. Even though the medical doctors are working to eradicate these kinds of problems they are inevitable.